Who Parties Like a Rockstar Under the Sea? This week is the official 10th anniversary of SpongeBob's premiere on Nickelodeon and Nick did it up right with a kick-off celebration at our offices here in Times Square. The entire staff was invited to dish on krabby patties, french fries, yellow cupcakes and yellow pineapple-tinis in our very own Bikini Bottom themed cafeteria. We had a "spongey" good time toasting to our favorite optimist! The afternoon was topped with a special visit from the Naked Cowboy, donning SpongeBob underwear and a Bikini Bottom-decopaged guitar. He sang a little tune to our honored guest before posing for pictures with our company president. We also had a special appearance from SpongeBob and Patrick themselves, none other than Tom Kenny and Bill Fagerbakke (some of you may remember him from his days on Coach with Craig T. Nelson) who affectionately informed us that 40% of us would be laid off following the meeting . . . something about management thinking we could take it easier if we heard the bad news in a cartoon voice. I hear the cupcakes were delicious . . . you can't imagine how difficult it was for me to abstain from partaking in all the culinary goodness. Every single item was forbidden on this new cleansing diet of mine . . . I just keep thinking to myself, "will I really make it 6 months?" Congratulations to Team Atreyu, the 3rd Place winners at the 80's Trivia Night at Big Daddy's Diner! Our team ended a fun filled Monday evening successfully placing third, only two points behind the evening's winner Yo Mallory, despite an upsetting final round sprint from Jessie's Girl that ultimately robbed us of the much coveted first place prize! After a successful showcase of correctly answering trivia questions like the principal's name in "Ferris Bueller's Day Off", Baby's full formal name in "Dirty Dancing", and what person Alex P. Keaton idolized in "Family Ties", Team Atreyu entered the final bonus round well in the lead and sure we would take the win! Unfortunately, the game was opened up as a free for all during the Bonus Round with a karaoke sing off of the theme song to "Growing Pains". When their name was randomly drawn, Jessie's Girl earned a full 5 bonus points just for singing the song to the angering crowd! Team Atreyu was definitely disappointed, but we still managed to secure a bronze prize! After an evening of fun, food, and friends, we won a $50 gift card toward our next visit at Big Daddy's. We're ready for a re-match and will be watching our fave 80's flicks in preparation for it! Looking Good for 232 years . . . 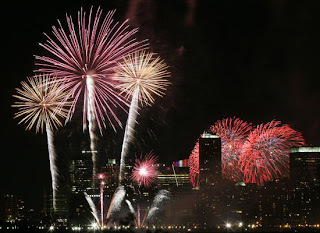 This year's 4th of July celebration was such an improvement over last year's! Carrie has been in the Hamptons since last week, but she was kind enough to come back to the City for the weekend since she knew I had such a miserable 4th of July weekend last year . . . she was determined to make it better for me this year! The weather could not have been more perfect. We had a high of 81 with low humidity and a fresh breeze from the ocean water. After making a wonderful picnic dinner, Carrie and I invited some of our girlfriends from church to stake a spot for the fireworks display. We arrived early and were able to pick a perfect place along the Hudson River nestled in the middle of a clearing of trees. From our vantage point, we were able to view all 5 barges along the river and watched the sky light up! What a way to celebrate! You Want to Transform This Into a Date? After a chance meeting at last week's Floating Kabarette and a week of friendly email banter, Taz and I agreed to go see Transformers 2 Friday night. I had intended to see the movie with my colleagues, but missed the film last week when I got called into a last minute meeting with Dreamworks. I was delighted when a week after the premiere, I finally found someone who hadn't already seen it themselves! And, Taz seemed like a really nice, fun guy to join me! But, I quickly found that Taz interpreted my invitation as a formal date. Before I could blink, he had already purchased both our tickets and was leading me up the escalator to our theater. And, over the course of the 2.5 hour film, his body slowly drew closer and closer to mine. Without even allowing the credits to finish, he immediately turned to me and asked, "what are we doing now?" I asked if he was hungry and he suggested we get dinner. With the non-stop rain finally letting up this weekend, we enjoyed a wonderful walk around Union Square before deciding on a late night dinner at The Coffee Shop. Sitting outside in the warm summer air was wonderful and Taz was a gracious host with plenty of non-stop conversation to offer. In fact, we had managed to talk so long that the server was ready to kick us out of our seats. We then moved inside to the bar and managed to converse late into the night before I finally announced I had to go home at 2am. After Taz walked me to the subway and wished me goodnight, I couldn't help but ask myself, "what just happened here?" I really like Taz; he's easy to talk to, smart, kind, and respectful. I'm just not attracted to him. . . why must dating be so complicated?